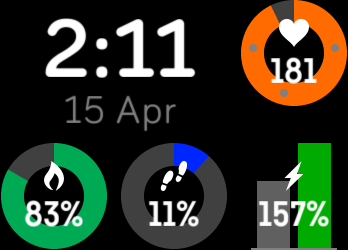 This app/clockface shows your current biorhythm chart and stats. Biorhythm theory started in the late 19th century, and holds that our physical, emotional and intellectual abilities vary in regular cycles. Some people also advocate a fourth cycle for intuition. Days when the cycles transition from positive to negative, or vice versa, are said to be critical (ie, especially bad). This app graphs your biorhythms for 2+ weeks ahead, and a few days previously. Today’s date is highlighted in grey. X indicates a critical value. To change settings, long-touch the screen or press one of the right side buttons. You can change the date of birth used, which lets you see biorhythms for other people. 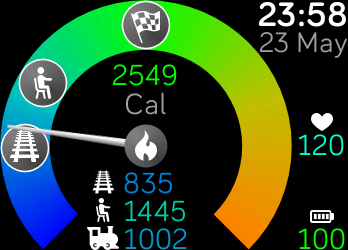 The app also displays one of the standard Fitbit activity measures (energy, steps, distance, active time, elevation, and heart rate). Touch the screen to cycle through them. 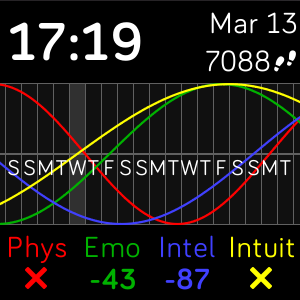 The Biorhythm clockface and app both cost US$1 (plus local taxes). If you buy the Biorhythm Bundle, you'll still only pay US$1, but you'll get both versions! What are biorhythms? What do the numbers mean? 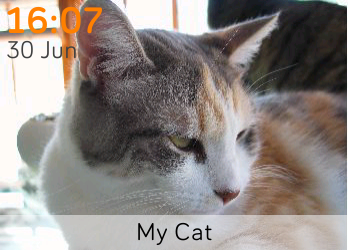 How do I know which day is today? How can I see which days are critical? Where can I find more info about payment for this app? General info on biorhythms, including their history, calculation and interpretation, can be found here and here (and other places). There's a fair bit of inconsistency among advocates about the legitimacy of the various cycles (which is why the app lets you hide the 'intuition' cycle). The biorhythm cycles are assumed to be sine waves, all starting on the day of birth. No other factors are taken into account, so a measure of skepticism is appropriate. Please see here for general info on biorhythms. The abbreviations are for 'physical', 'emotional', 'intellectual' and 'intuition'. The numbers range from -100 to +100 (like percentages), and should match the position of the corresponding line on the graph at today's date. A simple interpretation is that +100 is considered to be 'really good', and -100 (as well as critical) is 'really bad'. How do I know which day is today? On the graph, today is subtly indicated in grey. 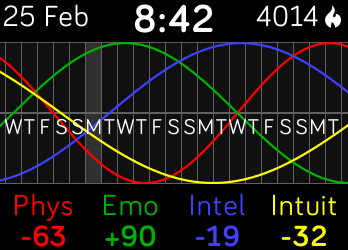 The values across the bottom correspond to today's biorhythms. How can I see which days are critical? Where can I find more info about payment for this app? Payment is handled by K-pay. They have a FAQ here.